Let me start by saying – you are not alone! So many women closet punish themselves around food cravings and wonder why am I always getting food cravings? I hear this question all the time from the women I work with. So know you’re not alone, and you can put food cravings to bed – for good! I promise you, let me guide you on where to start. We’ve been taught through meme’s, friend and society that food cravings are just part of being a woman. A normal part of PMS! You’d think that if you just found that healthy substitute for your craving or find that magic fix, you’ll say goodbye to your food cravings forever – right?! Food cravings are so much more complex than that. For most women Food Cravings are the hidden devil, the thing that takes over the body and before you know it the entire block of chocolate is gone… but how? But it doesn’t have to be this way, and it’s time to un-restrict ourselves. Excited to share this :why you crave foods, and what you can do about it. My clients are often surprised when I tell them that food cravings aren’t just a normal part of life! Food cravings might be common, but that doesn’t make them normal or healthy. There is also a big difference between desiring a food and craving it. If you find yourself wanting a particular food, it may simply be because that food is the nourishment right now. Or it might be that the food smells and looks appealing – think about when you walk past a restaurant, and the aroma wafts out the door. But food cravings go much deeper than just wanting a particular food, or any food for that matter. 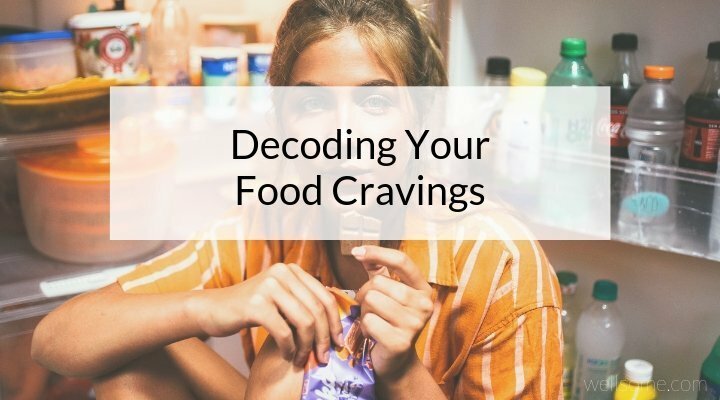 When you crave foods, you might restrict yourself from having it as part of a diet, gym program or self restriction, only for it to bust and you then go secretly binge on it later. Or perhaps your cravings continue even after you’ve just eaten a particular food? Often, you won’t feel satisfied until you’ve had that “one” food, no matter how much other food you’ve consumed. Know the feeling? Ladies, this is not your normal, healthy state of being! It’s a sign that something is out of balance somewhere in your body or mind, or even both. Why am I craving this food? Commonly women assume that their food cravings are solely pre-menstrual. BUT I hate to break it to you, we can’t use PMS as a… “My PMS did it!” excuse anymore. After you’ve begun discovering your cycle you’ll find that food cravings can be experienced throughout your monthly cycle, at any time. Most likely the reason you’re tying those cravings in to being pre-menstrual is because we’ve all been taught that cravings are normal part of ‘PMS’. Again I call BS. Ahhh that “normal” word makes me so frustrated. And you can be frustrated too – cause they’re not at all normal. BUT Whyyyyyy do I get food cravings? So if food cravings aren’t a normal, healthy experience to being a women – what is underlying them? Let’s explore some of the root causes of food cravings and debunk your own food cravings – for good? Ever found yourself eating particular foods when you’re stressed or simply bored? When you’re feeling a curtain way, say sad, frustrated, irritated or even lonely ain’t no block of chocolate safe in the house? There’s a good chance your food cravings could be emotional in nature. Are you trying to fill a void by eating “this” food? Is it a way to distract yourself from emotions you don’t want to experience? Has an emotional situation triggered your craving/s? Or has an emotion like loneliness been bubbling away under the surface for a while and you’re at the point of erruption? Asking these questions won’t magically fix your food cravings in one sitting but yes they will help you to tune into your body and emotions, and see begin delving deeper into what you really need, it’s something we focus an over a few weeks together in Well Woman. I’ve shared more about emotional eating in detail here, but the key with emotional-based eating is to tune into the emotion that’s taking over your body like a control ship and make you do things later you regret. PLUS – an insider secret, the answer to what you really need is not the food that you’ve craving! You probably already know that already but don’t know how to stop it, so start with these three steps which I use with all of my clients. Sometimes, we crave foods because it has something within it that we need. The body uses a wide range different nutrients for different processes throughout our cycle as well as our overall health, and from time to time we can sometimes see them as hormonal in nature. The most common example of this is craving chocolate when pre-menstrual. Chocolate actually contains the minerals iron and magnesium, which are used up by the body during the menstruation phase. Not to mention chocolate can also stimulate the release of endorphins, which can relieve cramping pains. Chocolate – YAY You say! This is when you consume high quality, chemical and preservative free chocolate, and yes this is still available in the supermarket you just need to read the labels! But how do you know if your cravings are based on what nutrients are in those foods you crave? This is why it’s so important to understand what you’re putting into your body everyday. If the food comes in processed or in a package, DO NOT buy it without looking at the ingredients list first. Is that list full of ingredients that you can identify? Or is it mostly numbers and chemical-sounding words? If it’s the full of things you don’t 100% know what they are good chance that your body wont either and it’s probably not going to make you feel any better, nor give your body the nutrients it needs. I could rave forever about this topic, intact it’s an entire weeks topic full of guides and how to shop processes that I teach in the Well Woman course. Been tracking your cycle emotional, nutritionally and hormonal in my Love Your Cycle tracker and noticing that the same types of cravings occur at the same time of your cycle consistently? This is a good sign that the craving your experiencing is hormonal in nature. As we are cyclical in nature and don’t revolve like a clock It’s important to know that YES you will eat differently throughout your cycle and that is perfect. So when we talking about hormonal food cravings, we’re not talking about your tendency to eat more sweet potato when you’re pre-menstrual or your preference for salads around ovulation. I’m talking about the common low mood, hormonal irritative cravings like chocolate, chips, ice cream and other sweets. If there’s a hormonal imbalance causing cravings through your cycle, I can guarantee that there are other signs that you most likely haven’t noticed either. For example you might have acne or breakouts when your hormones are fluctuating, or you might experience the dreaded PMS symptoms. You could even have weight that has snuck onto your hips and thighs thanks to your oestrogen levels. These signs are simply messages from the body to you, trying to communicate that your hormones are overtaking the show. When it comes to understanding and balancing your hormones, the first step always is to track your cycle and the signs. It’s easy, it’s free and it can show you so much about your cycle health. It’s rare for any food craving to have one sole cause, in fact it’s rare for ANY health challenge to have only one sole cause. From what I’ve seen, the majority of food cravings are a messy, complex combination of emotions, nutrient challenges and hormone imbalances. Addressing one area may help yes, but for long term results it’s not going to correct the problem if the other contributing factors keep ticking along. Don’t fret, you’re not alone and it is possible to balance them all out! I promise. If me and my clients have been able to do it easily – you can too! Ready to jump into tracking your cycle and discovering your cycle signs? I have a gift for you… just what you need to start your cycle tracking journey. Get my FREE Cycle Trackers (yep there is more than one) and Video Email Series here or below – click the button.